We lamented leaving our comfortable Princeville condo - but not for long. We drove south and stopped for lunch at the quaint and historical town of Koloa. Popua Beach was only a few more miles down the road. We soon were settled into our room at the Sheraton, watching surfers and listening to the roar of the waves. 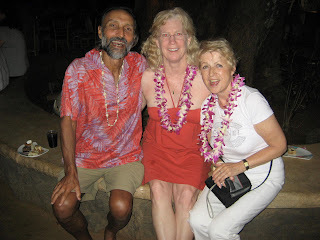 That evening we went to a luau at the Kilohana Plantation. It wasn’t cheap but it was a fabulous show. It wasn't just a bunch of young ladies in coconut shells over their breast doing a hula dance (not that there's anything wrong with that). Instead, the play told a story of families leaving Tahiti to cross the Pacific and sail to Hawaii. The finale was a dramatic fire-dance show. The luau included an open bar and a tasty buffet dinner - but no scotch. You have to wonder. The next day we drove to Waimea Canyon, which in Hawaiian means “red water”. Our drive took us above 3500 feet of elevation and yielded dramatic views of the canyon at every turn. We didn’t see any red water, but we did see lots of red hard-packed dirt. At the top of the canyon we stopped for a cup of coffee and got a chuckle from watching chickens and roosters competing for bread scraps given by a group of picnickers. The competition was hilarious. The following day, we were back in Oahu. Rich and I spent a few hours on the golf course while the ladies went to a Pacific Island Cultural Center. After golf, there was still time in the day to go for a short sail on the outrigger. That was a lot of fun. With four of us on the boat, she still made good headway. The next day, Diane, Erika and I took a walk along Waikiki and hiked up the side of Diamond Head from inside the crater. The view of Oahu from the top of Diamond Head was spectacular. But we all agreed - a few hours in Waikiki is all we needed. On our last day (26 April), Jill dropped us off at the airport. For Diane and Erika the Hawaii adventure was over - they were heading back to LA. For me it was continuing. I was headed for the Big Island for a couple of days to visit with friends Bob and Julie Bojorquez. Bob was prompt in picking me up at Kona Airport. As we drove to his home in Kohala Ranch, we drove through fields of lava - some of it was very jagged in appearance while other fields were looked more like large squished black boulders. On the sides of the road, people had used small white rocks to write the names of people. Bob told me that friends of Iron Man race participants had created all those slogans to pump up the runner’s spirits. Bob’s house lies in what used to be a huge ranch stretching from near the ocean to the top of the mountain. The house is situated near the mid-point and lies at about 2100 feet elevation. It offers expansive ocean views as well as views of three volcanoes (Mauna Loa, Mauna Kea and Hualalai). Pretty impressive sights. Activities were pretty much limited to the one full day I was there. Bob and I played tennis and afterwards visited the quaint towns of Havi and Kapaa and then went to a picturesque state beach park. In the evening the three of us went to the Hilton Resort at Waikoloa Village. That’s quite the resort - Disneyland on the ocean. It has trams and classic Chris Crafts motorboats to get around the property. There are displays of art works from Polynesia and other Pacific Islands spread throughout the resort. Of course there also are a variety of restaurants, bars and shops. Afterwards we had dinner at one of the nearby restaurants. The next day I made plans to visit with Nancy Pisicchio, an old cruising friend who lives south of Kona Airport. It had been well over twenty years when Diane and I last saw Don and Nancy, when they moved from the boat to a macadamia nut farm on the Big Island. Bob dropped me off at the airport and Nancy came by and picked me up shortly afterwards. The farm she lives on consists of eleven lush acres of macadamia nut and coffee trees, and a sundry of fruit trees. We had a lively chat about the old cruising days and then how she and Don settled in the Big Island. She spoke of her involvement in politics after she was told by a company that they had plans to put a road right through the middle of her farm to develop a 1200 acre parcel into a golf course and high-end homes. Nancy fought the already approved plan and got it negated. Afterwards she ran successfully for a seat on the county council. We also talked about the sad passing of her husband, Don. After our brief meeting, Nancy dropped me off at the airport. The Hawaiian vacation was over.